Ghost, The most comprehensive taxi dispatch & management system available today! Christopher McCausland, MD of Value Cabs Belfast, one of the leading taxi companies in the UK, tells us how the time is right to switch to Ghost. The recent installation of the Ghost system in Value Cabs, Belfast, is yet another example of a celebrated and highly successful Taxi company making the decision to switch to Ghost. Value Cabs, like many others in the industry, have recognised that Ghost is the most advanced taxi dispatch and management system available today. 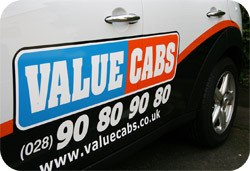 Value Cabs are one of the largest taxi companies in the UK, with decades of experience delivering a first rate service. With Ghost in place, Value Cabs can continue to deliver the high level of service that they have become renowned for whilst giving them the extensive system features needed for further expansion. autocab have been the World’s market leader for over two decades with an understanding and knowledge of the taxi industry which cannot be matched. Ghost is the pinnacle of over twenty years of research and development, consumer feedback and direct market experience making Ghost the most complete system available today, setting a new standard within the industry. Modern in appearance, yet so simple to use, Ghost is the most user-friendly system ever created by autocab. With Ghost in place the operators’ job is made fast and simple helping to improve efficiency and ensuring peak performance from your operators. Designed using cutting edge technology by autocab’s team of highly skilled and experienced programmers, every aspect of Ghost has been created to equip your company with the tools needed to reach its full potential. From the pioneering booking and dispatch tools to the extensive management reports or Ghost’s flexible accounts suite, Ghost is truly the next step in the evolution of taxi dispatch and management systems. Value Cabs, as a long-time autocab customer, have always been at the forefront of the taxi industry and for them, the time was right to upgrade making them yet another addition to the many that are now experiencing the benefits of the Ghost system. Christopher Mccausland, Value Cabs MD, had this to say about their recent installation of Ghost. ‘‘We are absolutely delighted to have Ghost installed here at Value Cabs. We take pride in ourselves being at the cutting edge of the taxi industry and there is no other system that is as advanced or as impressive as the Ghost system. Everything about Ghost has been designed to make my operators’ job as quick, simple and efficient as possible, vastly improving productivity. Ghost gives us rapid booking and dispatch, extensive management options and a flexible accounts suite. It is the most impressive system to date and gives us all the tools necessary to continue to consistently deliver the superb service that Value Cabs has become renowned for. With a customer-base as large and demanding as ours, we need a system which ensures we can continue to deliver a great experience for our customers but also a system which gives us the ability to grow even further. 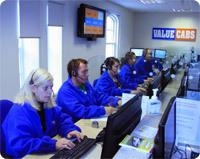 Autocab would like to say a big thank-you to everyone at Value Cabs for their co-operation and feedback.